Here will be posted Zanjux's work. Zanjux was the first artist to have adoptables up! Good job! 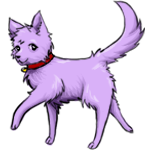 This lineart was also used by Blaise to create a different colour - check out her 'Created Pets' page to see them! None were made for December!